You are here: Home 2015 November What a Cisco Mobility Express Bundle! Cisco Mobility Express Bundle, What a Great Wi-Fi Solution for Small and Mid-sized Deployments! After got what the Cisco Mobility Express Solution is, you should know what is the Cisco Mobility Express Bundle? Cisco Mobility Express Bundle is a full-featured enterprise solution for small to medium WiFi deployments up to 25 Access Points and expandable up to 75 Access Points. Built on Cisco’s industry-leading 802.11ac portfolio, a Wireless LAN Controller 2504 is provided at a nominal cost complete with a 25 Access Point license —included with purchase of any SKU containing two Aironet Access Points. Setup takes just a few minutes. Faster provisioning in less than 5 minutes. Higher bandwidth and longer battery life with IEEE standard 802.11ac. Greater client density to handle multiple devices. The Cisco Mobility Express Bundle comes in three different variants, designed for a variety of different network sizes and feature needs. It is built with Cisco Aironet Access Point part numbers CAP1700I, CAP2700I and CAP3700I. Cisco Mobility Express Bundles is ideal for small or medium-sized businesses such as K-12, small retail shops or hotels/motels that want to offer Wi-Fi Services to their guests. Mobility Express Bundle offers these customers the additional benefits for simple network installation and management. More Qs about Cisco Mobility Express Bundle may be asked by clients who want to order the Cisco Mobility Express bundle. Cisco Mobility Express bundle is available with the WLC2504 plus a license for 25 access points. Can adder licenses be stacked on the license? Yes. Adder licenses can be purchased up to a total of 75 access points per controller. Is there a limit to the number of units purchased per customer? There is no limit on the number of Cisco Mobility Express Bundle units a customer can purchase. If a customer purchases 10 Cisco Mobility Express Bundles, will they get 10 units of the WLC2504? Yes, a customer will get 10 bundles as ordered. Are Cisco Mobility Express Bundle licenses transferable? Base licenses of 25 access points cannot be transferred; however, adder licenses are transferable. If a customer would like to upgrade the controller to the Cisco 5508 or 5760 controller, can access point licenses be ported to these controllers? License portability is not supported for any other controller. Can Cisco Mobility Express Bundle be configured with external antenna access points? 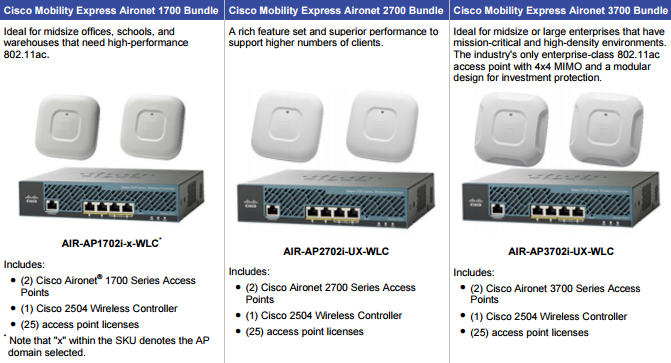 Cisco Mobility Express Bundle will have the option to select external antenna access points at the end of March 2015. 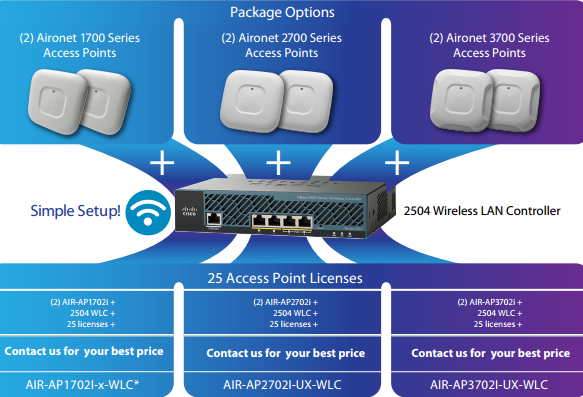 Aironet Access Point models to be supported are part numbers CAP1700E, CAP2700E, and CAP3700E. Can Cisco Mobility Express Bundle be configured with outdoor access points? No. Cisco Mobility Express Bundle cannot be configured with outdoor access points. I see that Cisco Mobility Express Bundle is configurable with the Cisco 2504 Wireless Controller (WLC2504). Will the 5508 or 8510 controllers be added in the future? No. There are no plans to add any other controllers to the Cisco Mobility Express bundle. 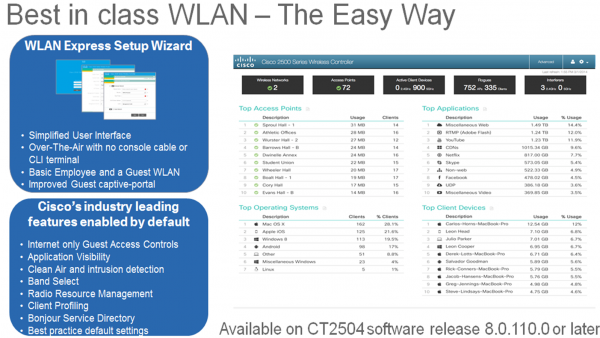 Is the image used in Cisco Mobility Express Bundle a normal image of the WLC2504? Cisco Mobility Express supports 8.0MR1 with OTAP provisioning. Can customers purchase two sets of Cisco Mobility Express Bundle and use them as high-availability (HA) pairs? No. If two bundles are used they cannot be used as an HA pair. However, N+1 redundancy is supported. What is OTAP? “OTAP” stands for over-the-air provisioning. The WLC2504 controller can be configured over the air from a wireless client. What is an “embedded UI”? Is it limited to Cisco Mobility Express Bundle only? Can it be used in existing WLC2504s that customers purchased previously? An embedded UI provides an easy and simple way to configure a WLC2504 in just minutes. The embedded UI can be used only on new purchases, because the controllers are loaded with the new image. Is Fast Track / Fast Track Accelerator applicable to Cisco Mobility Express Bundle? Yes. 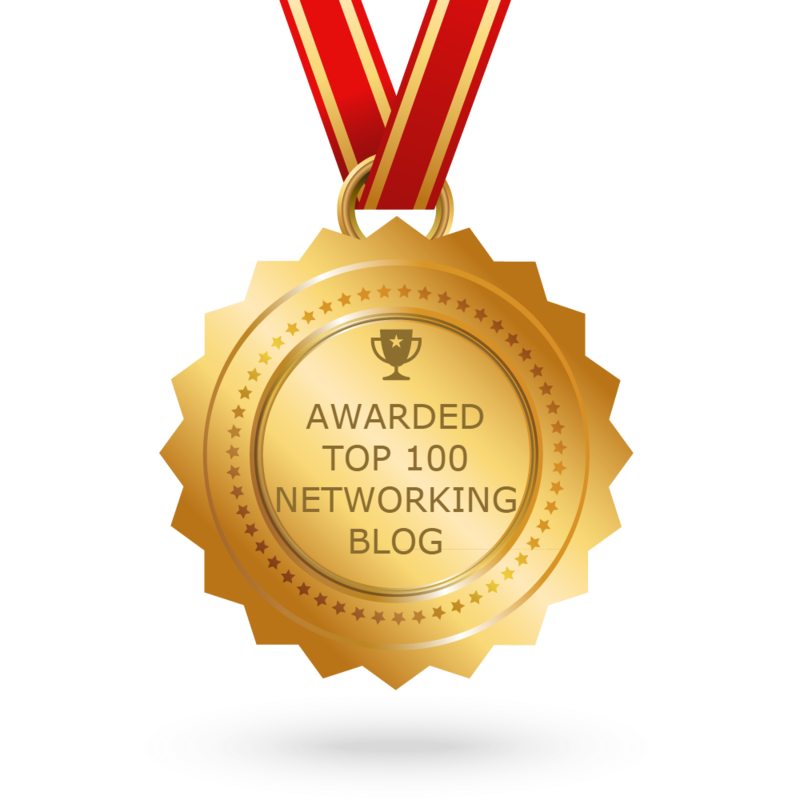 Will the Value Incentive Program (VIP) be applicable to Cisco Mobility Express Bundle? Yes. Cisco Mobility Express Bundle will be part of the VIP25 plan. Rebates will be in line with 802.11ac access points that are part of Cisco Mobility Express Bundle. What is the return material authorization (RMA) process for a failed part? Is it per device or the whole bundle? RMA applies to an individual failed component. Is there a cap on standard discounts that the Cisco Mobility Express Bundle is eligible for? Standard discounts that are applicable to Cisco wireless products are also applicable to Cisco Mobility Express Bundle. Is Cisco Mobility Express Bundle eligible for the Unified Access Breakaway and the UA Breakaway Upsell Accelerator? No. The UA Breakaway and UA Breakaway Upsell Accelerator do not apply to Cisco Mobility Express Bundle. When is Cisco Mobility Express Bundle available? The Cisco Mobility Express Bundle is available now through July 2016.